Are you a Cancer? Even if you’re not – come out to celebrate! This birthday party (more like a neighborhood block party) will be a guaranteed good time! Come out to enjoy music, dancing, food, and drinks! Reconnect with old friends while building new relationships.. dont’ miss out! A once vacant lot in the center of Homewood is now home to a vibrant, active space. Depending on the day of the week and time, you may find yogis lined up for a pay-what-you-can yoga session, a neighborhood birthday potluck for one of the young residents, or a late-night dance party with DJ spinning motown and local vendors selling their creative wares and art. “Kenny’s exists to give residents a new and different experience while allowing people from outside the neighborhood an avenue to experience the greatness that is Homewood,” said Demi Kolke, the Founder and Owner of Kenny’s. Demi built deep roots and connection with the community, through years of working with the local community development group, Operation Better Block. During her time working on various community development projects, she kept hearing the same thing from the residents of Homewood; they wanted to return their neighborhood to its former glory. They would reminiscence about the how Homewood used to be – a neighborhood with a thriving business district, strong community ties, and neatly maintained rowhomes. The story of Homewood is not unique to the City of Pittsburgh. Currently, the neighborhood’s population is just 17% of its peak of 35,000, leaving nearly 2,000 vacant lots and 600 empty buildings in the majority Black neighborhood. The blight has been more persistent than in other neighborhoods due to structural racism, elevated crime activities, and lack of investment, leaving Homewood slower to rebound than other neighborhoods within the City. That didn’t stop the neighbors from taking action on their own. Kenneth Stubbs was one such neighbor dedicated to changing the narrative of the neighborhood he was so proud of. At first, he was weary of Demi, a young woman originally from North Dakota. His hesitation soon faded and they formed a strong and unlikely friendship. Tragically, that friendship came to an end when Kenneth was murdered in 2014. In his honor, Demi purchased a vacant lot that he had owned and turned into a safe, accessible, informal outdoor gathering space: an idea born from countless conversations with him. She named it Kenny’s in his honor. Kenny’s website describes the space as a “community and cultural gathering space”. The intent is to give a platform for the great activities that are going on in the neighborhood. One night in June, Demi’s former employer, Operation Better Block, hosted a summer kick off potluck. 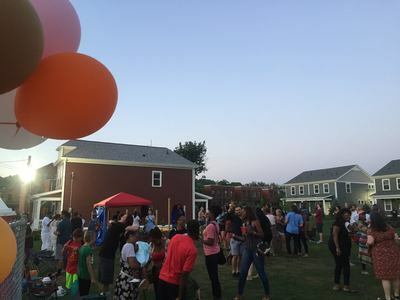 Residents brought dishes, kids chased each other on the grass and neighbors met one another, many for the first time. For Robert Bey, resident and former friend of Kenneth, Kenny’s space means an opportunity to get to know his neighbors. He is thankful for the access to the space so he can program it for the kids in his neighborhood. The Vibrancy Funds will be used to continue such programming the space throughout the summer so everyone will be able to participate in the events on site. Kenny’s sits on a corner, with a bevy of energetic children to one side, and the older residents who remember what Homewood once was on the other. In addition to the Vibrancy Funds, Demi has secured funds from Lively Pittsburgh to offer additional programming centered around building connections between the generations. Much like Mr. Stubbs himself, Kenny’s the space, is not there to work for the community, but rather with the community. You can check out a full list of upcoming events at Kenny’s here. The Vibrancy Funds are made possible by a gift from the Henry L. Hillman Foundation. Interested in finding out how we can help bring your idea to life? Contact us.